Venous obliteration is an anatomical definition that corresponds to a reduction in the circulating channel of a vein, regardless of the cause. Complete obliteration is known as occlusion. Venous obliteration is characterized by direct ultrasound criteria at the stenotic site, and it involves obtaining the ratio of the prestenotic to the stenotic diameter as well as the ratio of the prestenotic to the stenotic velocity. Venous obstruction is a hemodynamic notion that corresponds to a reduction in the venous flow, which results in a lack of drainage of the obliterated vein’s territory and venous hyperpressure in the distal afferences. The obstruction may have a functional or an anatomical origin, secondary in the latter case to the obliteration. It is characterized by indirect ultrasound criteria in the distal veins. The three main criteria, which are recorded in the common femoral vein ipsilateral to the proximal stenosis, are the single-phase flow profile, velocity, and flow indices. Substitution is also a hemodynamic notion, inseparable from that of obstruction. It imposes hemodynamic changes to a preexisting venous network, characterized essentially by an increase in venous diameter and circulatory velocities. These terms, defined based on venous insufficiency of the lower limbs, remain relevant in the other territories. In particular, they enable a consistent approach to the management of the nutcracker syndrome in the context of pelvic varicosities. How useful can words be if we don’t use them accurately? Chronic venous insufficiency results from two pathological mechanisms: reflux and venous obstruction. Venous reflux is well defined, whereas venous obstruction is not so well defined, and this semantic imprecision could generate inaccuracies in the interpretation of study results and ultimately in the therapeutic management. Venous obliteration is an anatomical definition that corresponds to a reduction in the circulating channel of a vein, regardless of the cause. Complete venous obliteration (absence of a circulating channel) is known as venous occlusion. Venous obliteration can have several origins: (i) thrombotic, ie, acute venous thrombosis or postthrombotic anatomical sequelae; (ii) extrinsic compression, ie, May-Thurner syndrome, nutcracker syndrome, and tumor compression (Figure 1); (iii) tumor invasion; and (iv) congenital, ie, hypoplasia or venous agenesis. With these definitions, which are also relevant for the arterial sector, it should be noted that: (i) direct ultrasound criteria, which is measured at the site of stenosis, only measures the degree of venous obliteration; (ii) only indirect ultrasound criteria, measured at distal veins, afferences of the obliterated proximal vein, reflect the degree of obstruction. 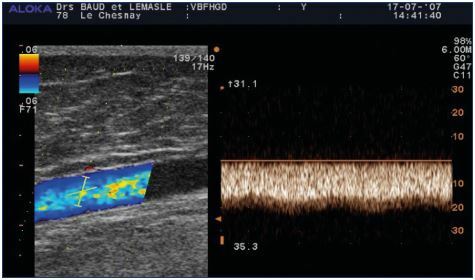 Considering this information, it means that intravascular ultrasound, which is used to quantify the reduction in the diameter of the proximal venous axis and evaluate the feasibility of a recanalization procedure, does not allow for the evaluation of venous obstruction. It is evident that there is a relationship between the degree of obliteration of the proximal vein and the obstruction recorded in the distal veins. The difference between an obliteration that will be obstructive and one that will not is the development of an effective collateral pathway (Figure 2). This point was illustrated in the study by Kurstjen et al.2 The author hypothesized that postthrombotic syndrome complaints do not always reflect the severity of postthrombotic lesions during an imaging examination and that this discrepancy could be explained by the development of collateral circulation. To test this hypothesis, he measured intravenous pressure at rest in the decubitus position in 14 patients with unilateral iliofemoral postthrombotic venous obliteration in the two common femoral veins. Secondarily, he measured the pressure of the common femoral vein of the healthy limb after abrupt occlusion of the external iliac vein with a balloon. As expected, the results (Table I) show that the common femoral venous pressure is increased in postthrombotic ipsilateral proximal vein obliteration, but not as much as after an abrupt balloon occlusion. This difference can only be explained by the development of collateral circulation, which is more or less effective, but present during a chronic occlusion and absent in the case of a brutal occlusion. Figure 1. Iliocaval obliteration by extrinsic compression due to voluminous adenopathies. Figure 2. Pathophysiology of venous obstruction. Table I. Results of Kurstjens’ study. Based on data from reference 2: Kurstjens RL et al. Phlebology. It is interesting to review the ultrasound criteria proposed for the diagnosis of proximal venous obstructions against these two definitions. 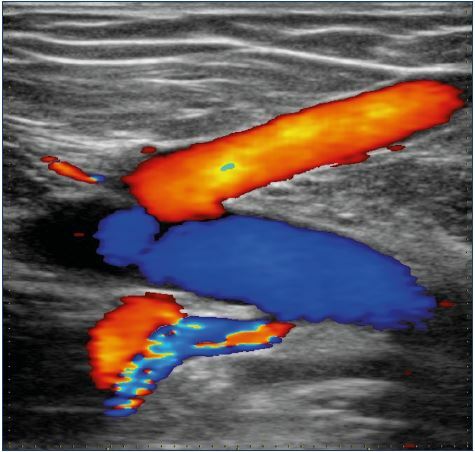 In 2016, Metzger et al3 proposed an ultrasound algorithm for, according to his terms, the detection of iliac venous obstructions. In this prospective study, 51 patients with iliac venous obliteration with chronic venous insufficiency (clinical, etiological, anatomical, physiological [CEAP] class 3 to 6) received a duplex computed tomography scan, intravascular ultrasound, and a phlebography. Five ultrasound parameters were collected: (i) the monophasic profile of venous flow in the femoral vein of the affected limb; (ii) a femoral venous flow rate index (ie, ratio of venous flow rates at the common femoral veins and the ipsilateral control; (iii) femoral venous velocity index (ie, ratio of venous velocity peaks in common femoral veins and the ipsilateral control); (iv) a ratio of the velocities at and just before the iliac venous stenosis; and (v) a ratio of the diameters at and just before the iliac venous stenosis. In this article, the term “obstruction” is used interchangeably to refer to the reduction in the diameter of the iliac vein (the diameter ratio is referred to as the obstruction ratio) and hemodynamic consequences in the distal veins. However, only the velocity index, the flow-rate index, and the monophasic-flow profile of the common femoral vein reflect the hemodynamic impact on the distal veins and thus the venous obstruction. 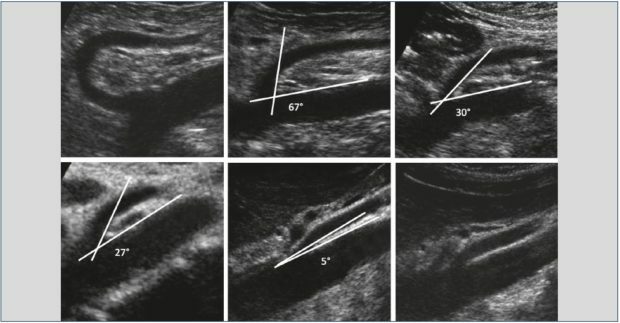 Velocity and diameter ratios only measure the reduction in venous diameter (or obliteration), which is in agreement with Labropoulos et al,4 who, in 2007, proposed that a ratio of stenotic to prestenotic velocity >2.5 was the best ultrasound criteria for detecting venous stenosis >50% (evaluated by a pressure gradient >3 mm Hg). These remarks do not call into question the relevance of the ultrasound algorithm proposed by Metzger et al3 for the detection of proximal venous lesions. In this proximal venous obliteration context, the indirect ultrasound criteria, considered the most relevant, are always recorded at the common femoral vein. The indirect criteria include breathing demodulation, a decrease in the response to the Valsalva maneuver, a decrease in circulatory speeds, and a decrease in flow rates. In 2007, Lin et al,5 in a retrospective study, analyzed 2936 ultrasound examinations. He identified 124 single-phase fluxes in the femoral vein, 64% of which corresponded to an iliac venous obliteration diagnosed by angioCT. No cause was determined for 45 monophasic fluxes, and the causes of iliac obliteration were postthrombotic syndrome (47/79), extrinsic compression (26/79), or hypoplasia of the common iliac veins (6/79). The authors found that this flow pattern was systematically investigated at the external iliac vein and common femoral veins and, in the case of a positive result, another imaging examination was done to determine the cause. In 2016, Kayılıoğlu et al6 specified the analysis of femoral venous flux profile in a retrospective study that included 86 patients. All patients had iliocaval obliteration, which was confirmed by intravascular ultrasound or angioCT. Three flux profiles in the femoral vein were described: (i) normal breathing modulation, with respiratory arrest (Figure 3A); (ii) decreased breathing modulation, without respiratory arrest; and (iii) monophasic, permanent, single-phase flux that is not modulated by breathing (Figure 2B). In addition, three types of responses to the Valsalva maneuver were identified: (i) complete stop in the flow; (ii) flow reversal; and (iii) flow that is not stopped. In the statistical analysis, the last two profiles were combined and named continuous flows. Monophasic and continuous fluxes were associated in 38% of cases. In this study, two criteria appear to be particularly relevant: the single-phase femoral venous flow and the combination of single-phase spontaneous flow and continuous flow (as defined above) during the Valsalva maneuver (Table II). 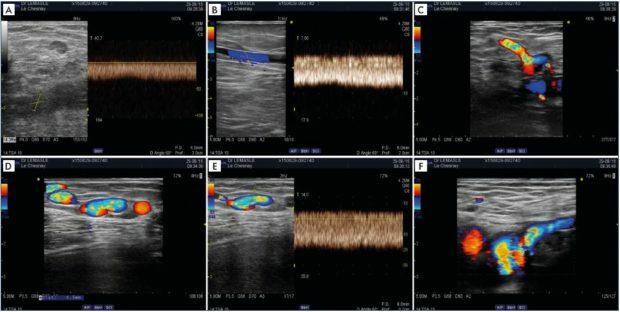 An analysis of the results showed that the sensitivity of the mentioned ultrasound criteria to detect proximal venous obliteration increases with the degree of venous stenosis. Sensitivity is always inferior to specificity, which reflects the fact that venous obliteration may not be obstructive in the case of an active and sufficient substitution. The simple reduction in respiratory modulation of venous flow has a very low diagnostic value. Figure 3. Profile of venous flow in the common femoral vein. to the Valsalva maneuver for the diagnosis of obstruction. Based on data from reference 6: Kayılıoğlu et al. J Vasc Surg Venous Lymphat Disord. 2016;4(1):2-8. In these two previous studies, the analysis of femoral venous fluxes is qualitative. Metzge et al3 proposed a quantitative approach. In his study, the best threshold values to detect proximal venous stenosis greater than 50% were 0.9 for the velocity index and 0.7 for the flow index; however, the real issue may be occurring somewhere else. By using indirect hemodynamic criteria, it should be possible to provide a better definition of the group of patients who are at risk of developing severe chronic venous insufficiency and not only to predict the degree of proximal venous stenosis. 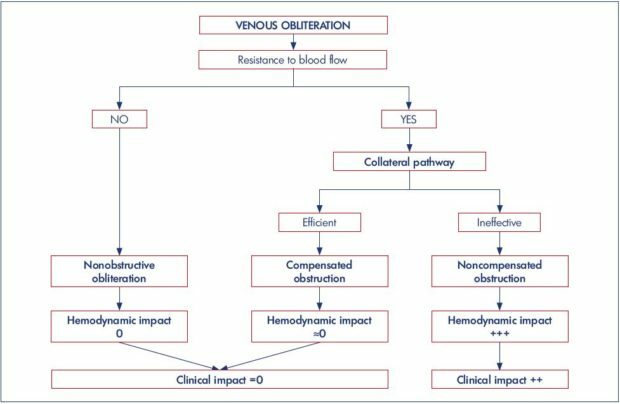 The risk of venous obstruction is directly related to the degree of venous stenosis, but with an equal reduction in diameter, the hemodynamic consequences will vary according to the quality and efficiency of the collateral pathway. First, the quality of substitution depends on local anatomical networks. At best, the territory is drained by several venous axes and the obliteration of one axis will be compensated naturally and efficiently by the other drainage axes. At worst, the obliteration concerns a single, poorly connected collector axis or a venous junction, particularly a femoral junction, and compensation will always be insufficient. In addition, this preexisting collateral network will have to adapt to the new hemodynamic constraints. The modification of venous pressure gradients is always accompanied by an inversion of the flow in the surrogate vein. This inversion can be very segmental; for example, the great saphenous vein, supplying a femoral obliteration, circulates physiologically, but the passage of the deep venous flow toward the superficial pathway imposes an inverted flow in a connection between the two networks. It can be extended; for example, inversion of the flow of the internal iliac vein causing a secondary obliteration of the common ipsilateral iliac vein (Figure 4). The hyperflow in the replacement network will result in an increase in venous diameter and circulatory velocities, with a permanent flow, and little or no modulation by breathing (Figures 5 and 7A). Figure 4. Chronic postthrombotic obliteration of the left common iliac vein. Panel A. Drainage of the external iliac vein by the enlarged internal iliac vein – distal common iliac vein with decreased caliber. Panel B. Permanent, demodulated, inverted flow in the substitute internal iliac vein. after obliteration of the femoral vein. that is not modulated by breathing. common femoral vein, ie, inverted fluxes. Figure 7. Postthrombotic left iliac venous obstruction and substitution syndrome. 3 years later showed persistence of a left iliac venous obstruction (Panel A) and persistence of significant substitution (Panels B–F). junction via the superficial epigastric vein. Therefore, substitution, like obstruction, is a hemodynamic notion. Substitution and obstruction are linked, as a chronic venous obstruction is always accompanied by the introduction of a more or less effective substitute circulation, and, conversely, the persistence of substitute circulation attests to a residual obstruction. This idea is illustrated in a recent study by Kolluri et al,7 where, in a small population of 15 patients, inversion of the superficial epigastric vein flow was always correlated with iliocaval occlusion. Of these 15 patients, 5 benefited from a recanalization procedure, 2 were lost to follow-up, and, in 3, the flux at the superficial epigastric vein was normalized 4 to 5 weeks after the procedure. In our practice, the afferents of the saphenofemoral junction (superficial epigastric vein, iliac circumflex vein, and lateral pudendal vein) are also substitutes when obliteration affects the femoral and common femoral veins. Therefore, the extension of a thrombosis to the saphenofemoral junction is a pejorative criterion (Figures 6 and 7). The main limitation of a duplex scan in evaluating proximal venous obstruction is the impossibility to obtain a dynamic examination, which requires further investigation, such as plethysmography and/or invasive measurements of venous pressure. In 2016, Kurstjens et al8 studied a population of 22 patients with unilateral femoro-iliac postthrombotic obliteration. Bilateral, invasive, and simultaneous pressure measurements in the femoral vein and dorsal vein of the foot were performed during a standardized treadmill test. The increase in venous pressure in the femoral vein after walking is significant on the affected side: 28 mm Hg compared with 2.1 mm Hg in the healthy control limb. However, the most discriminating factor between affected and unaffected limbs was the evolution of the pressure curve during recovery. These variations in pressure may explain venous claudication, but these measurements are not obtained with a duplex scan. In addition, a duplex scan cannot detect lesions that do not reduce the circulating channel very much, such as parietal synechia or an intimal flap, but which can transform a laminar flow into a turbulent flow, thus generating an obstructive flow disturbance. Only dynamic examinations can reveal these lesions. These terms, defined based on venous insufficiency of the lower limbs, remain relevant in the other territories. In 2005, Milka Greiner proposed a classification of pelvic varicose vein disease based on pathophysiological criteria.9-11 She defined three types (I–III) that require specific therapeutic management. Type I is secondary to parietal or valve abnormalities and is a reflux pathology; treatment is based on endovenous procedures and embolization. Type II is secondary to compression of the drainage vein and the pathology is linked to the development of drainage pathways. In this case, the isolated treatment of the refluxing vein, without lifting the compression, is potentially deleterious and can aggravate distal venous hyperpressure. Type III has a local extrinsic cause that is responsible for pelvic venous anomalies. For the type II class, the most common case is the nutcracker syndrome. In this case, a pelvic varicose vein is fed by the reflux of the left ovarian vein, which has become the replacement pathway for the left renal vein, which is compressed at the aortomesenteric entrapment, in its anterior form (the most frequent). However, anatomical compression of the left renal vein at this clamp is very common. Therefore, the whole problem is to evaluate the hemodynamic impact in the distal veins of this anatomical compression, in other words, whether this obliteration is obstructive or not. In our practice, we use the algorithm illustrated in Figure 8, where each positive step imposes the next step. The first step is to look for an extrinsic anatomical compression of the left terminal renal vein (Figure 9). It is based on the measurement of the angle and distance of the aortomesenteric entrapment. According to Arima et al,12 an aortomesenteric angle <16° and an aortomesenteric distance ≤5 mm favor compression of the left renal vein. Anatomical compression of the left renal vein is frequently found in the decubitus position. Always check that the compression persists in a seated position. If not, this compression is positional and a priori nonpathogenic. Figure 8. 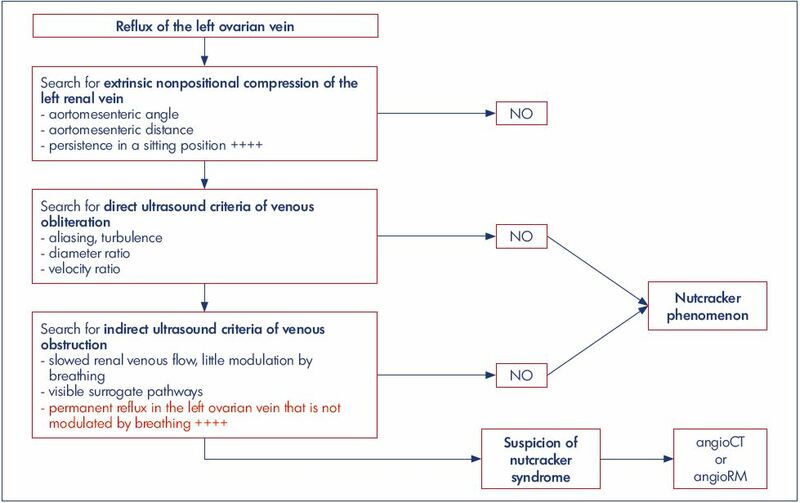 Decisional ultrasound algorithm in the management of nutcracker syndrome, in the context of pelvic varicose veins. persistence in a sitting position” width=”620″ height=”323″ /> Figure 9. First step of the algorithm to determine whether the venous obliteration is obstructive. persistence in a sitting position. The second step is to look for direct ultrasound criteria for venous obliteration. 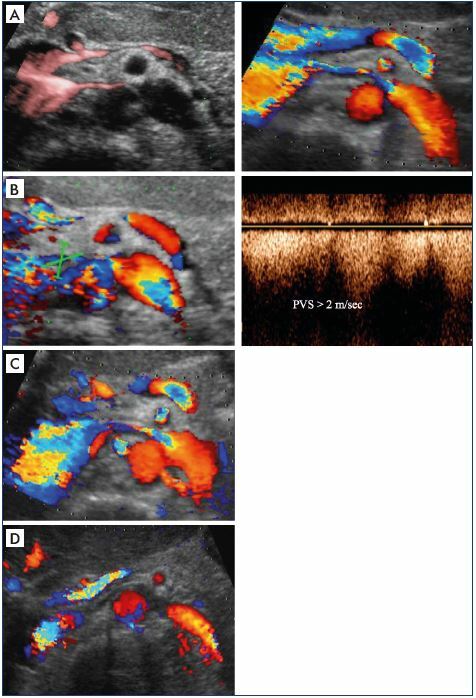 It combines qualitative ultrasound criteria (ie, aliasing and turbulence in color Doppler) and quantitative criteria (ie, ratio of the anteroposterior diameters and velocity peaks), which are measured at and just before the left renal vein stenosis (Figure 10). According to Kim et al,13 the sensitivity and specificity for the diagnosis of the nutcracker syndrome is 69% and 89%, respectively, for anatomical criteria and 90% and 94% for the velocity criteria, when the ratios are greater than 5. When the two ratios are combined, sensitivity and specificity are 90% and 100%. This study was based on a population of 16 patients with nutcracker syndrome who were compared with a control population. The third step should look for indirect ultrasound criteria of venous obstruction. The venous flow of renal drainage is slowed, with little modulation by breathing. It has a circulatory profile similar to that of the surrogate ovarian vein. There is no obstruction without the introduction of a more or less effective substitute circulation. They become abnormally visible because they are dilated, with rapid circulatory velocities. 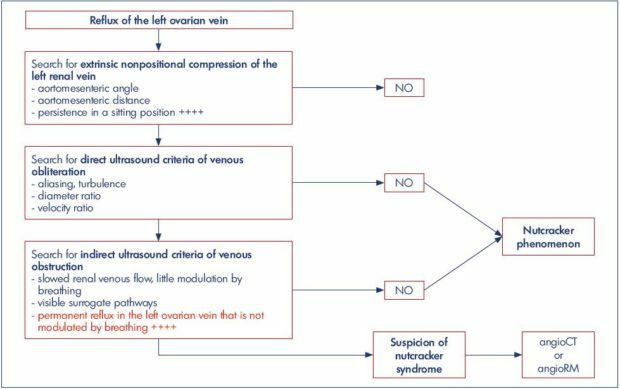 In our practice and in the context of pelvic varicose vein disease, the most relevant indirect ultrasound criterion of obstruction is qualitative and corresponds to a reflux of the left ovarian vein, which is permanent and not modulated by breathing (Figure 11). the venous obliteration is obstructive. stenosis (pulse-repetition frequency and filters). by breathing. Panel B. Flux in the ending of the left renal vein. Panel C. Reflux in the left ovarian vein at the psoas muscle. Panel D. Flow in lumbar vein at the reno-azygo-lumbar arch. The notion of obstruction is essential in the context of pelvic varicose veins. Nonobstructive compression of the left terminal renal vein associated with reflux of the ipsilateral ovarian vein corresponds to type I of the Greiner classification and treatment is based on embolization. Conversely, if the compression is obstructive, it is a type II class and the risk-benefit ratio of the compression treatment must be evaluated to avoid increasing renal venous pressure by removing an effective surrogate pathway. When the ultrasound examination is in favor of obstructive compression of the terminal renal vein, it is necessary to complete the assessment with an angioCT or a contrast-enhanced MR angiography. It is legitimate to wonder about the real interest of this apparent semantic complexity; however, this language effort seems useful for at least two reasons. If the term “obstruction” refers at the same time to a proximal lesion (diameter reduction) and its hemodynamic consequences (impaired flow), there is an ambiguity in the language, which may induce a therapeutic ambiguity. However, the only challenge is to combat the hemodynamic impact and clinical complications, not to correct a well-compensated obliteration. Finally, it is important to obtain a definition in a common, consensual, and international language. 1. François Becker. Dictionnaire des Termes de Médecine Vasculaire. Issy-les- Moulineaux, France: Masson; 2008. 2. Kurstjens RL, de Wolf MA, van Laanen JH, de Haan MW, Wittens CH, de Graaf R. Hemodynamic significance of collateral blood flow in chronic venous obstruction. Phlebology. 2015;30(suppl 1):27-34. 3. Metzger PB, Rossi FH, Kambara AM, et al. Criteria for detecting significant chronic iliac venous obstructions with duplex ultrasound. J Vasc Surg Venous Lymphat Disord. 2016;4(1):18-27. 4. Labropoulos N, Borge M, Pierce K, Pappas PJ. Criteria for defining significant central vein stenosis with duplex ultrasound. J Vasc Surg. 2007;46(1):101- 107. 5. Lin EP, Bhatt S, Rubens D, Dogra VS. The importance of monophasic Doppler waveforms in the common femoral vein: a retrospective study. J Ultrasound Med. 2007;26(7):885-891. 6. Kayılıoğlu SI, Köksoy C, Alaçayır İ. Diagnostic value of the femoral vein flow pattern for the detection of an iliocaval venous obstruction. J Vasc Surg Venous Lymphat Disord. 2016;4(1):2-8. 7. Kolluri R, Fowler B, Ansel G, Silver M. A novel duplex finding of superficial epigastric vein flow reversal to diagnose iliocaval occlusion. J Vasc Surg Venous Lymphat Disord. 2017;5:358-362. 8. Kurstjens RL, de Wolf MA, Konijn HW, et al. Intravenous pressure changes in patients with postthrombotic deep venous obstruction: results using a treadmill stress test. J Thromb Haemost. 2016;14(6):1163- 1170. 9. Greiner M. Syndrome de congestion pelvienne : diagnostic et traitement. Phlébologie. 2005;58(3):293-298. 10. Greiner M, Dadon M, Lemasle P, Cluzel P. How does the patho-physiology influence the treatment of pelvic congestion syndrome and is the result long-lasting? Phlebology. 2012;27 (suppl 1):58-64. 11. 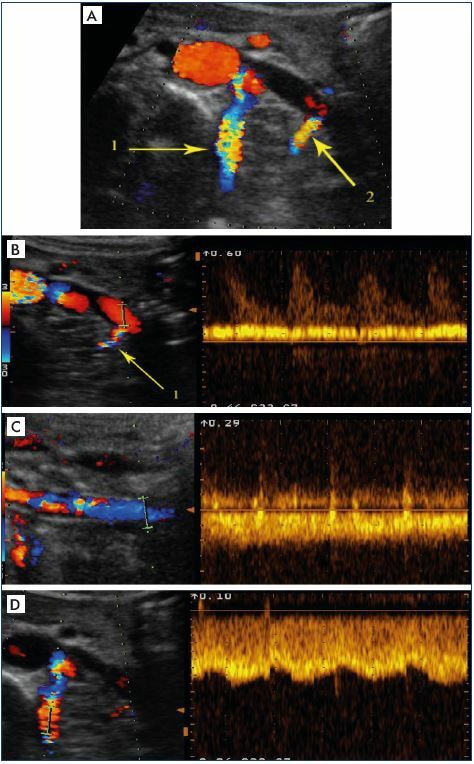 Lemasle P, Greiner M. Duplex ultrasound investigation in pelvic congestion syndrome: technique and results. Phlebolymphology. 2017;2(24):79-86. 12. Arima M, Hosokawa S, Ogino T, Ihara H, Terakawa T, Ikoma F. Ultrasonographically demonstrated nutcracker phenomenon: alternative to angiography. Int Uro Nephrol. 1990;22(1):3-6.